Though often understood in ecological terms, the word ‘environment’ can also be viewed more widely as the surroundings and conditions of a specific system—whether they be mechanical, biological, social or chemical. Culture arises from and then informs these systems, becoming itself a further component of environments. Science fictional texts have explored the interactions between culture, environments and bodies on a wide spectrum of scale: from the level of a planetary biosphere or climate system (e.g. terraforming) to a single body or organ (e.g. genetic engineering). This conference will gather Science Fiction researchers, critics, authors and readers together to discuss intersections between cultural and organic systems in all forms of SF media. Venues: B03, B04, B06 in 43 Gordon Square. After the conference activities finish, we will move to a nearby pub for some relaxed drinks and socialising, before proceeding to a restaurant for the conference dinner. Meals are not provided, but hot beverages and snacks will be available during breaks. Delegates will receive a digital copy of the conference programme by email, whilst print copies will be available at the conference free of charge. Conference Organizers: Rhodri Davies, Francis Gene-Rowe, Aren Roukema. 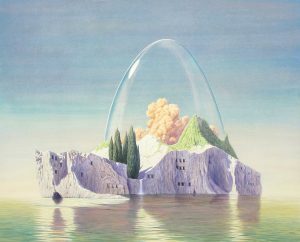 Image: Hermetic Island by Tristram Lansdowne: watercolour on paper, 34 x 43 inches, 2010.